Another in the long line of world-class goaltenders who tended the nets for the Reds, the “Gumper” was a 1980 inductee into the NHL’s Hall of Fame. Although he played 21 years in the NHL, his career didn’t begin until he was 24. Prior to his 1952-53 debut, he had played in 5 different leagues. In 1957, his only season with Providence, he recorded a 3.26 GAA and a 12-11-2 record in 25 games. He played 861 games during his incredible 21-year NHL career (1952-1974) compiling a 2.88 GAA, a 335-352-150 record and 43 shutouts. At the time of his retirement, at age 44, only 2 goaltenders, Terry Sawchuck and Glenn Hall, had played more NHL games. It wasn’t until his last 6 games of his final 1973-74 season that he wore a mask. 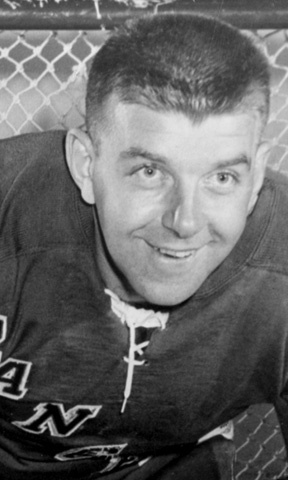 Most impressive of all, Worsley won four Stanley Cups, twice shared the Vezina Trophy as the NHL’s best goaltender, and was named the league’s Rookie of the Year in 1952, despite playing for the last-place Rangers and a season that saw him record a 13-29-8 record.